Driving towards downtown Orlando, exit on the sign that says Amelia Street, Bob Carr. Cross Amelia street on the first traffic light after the exit and you will be on North Garland street. Stay to the right to turn right at the next intersection which is West Concord St. You will cross a railroad track. At the next traffic light turn right on Orange Avenue. At the next traffic light you cross Amelia St and after about 50 yards, on your left, you will see the courthouse building that is on this picture. Driving towards downtown Orlando, exit where you see the Colonial Drive sign. At the end of the exit turn left on Colonial Drive, which is also US 17. You will go under the underpass and cross a railroad track. Turn right on North Orange Avenue, which is at the first traffic light. At the next traffic light you cross Amelia St and after about 50 yards, on your left, you will see the courthouse building that is on this picture. Driving North, exit where you see the Sanford sign, which is exit 104. Turn left on US 17, also called West Seminole Boulevard when arriving at Sanford. Driving North, exit where you see the Sanford sign, which is exit 104. Turn right on US 17 and you will go under I-4. Stay to the right on US 17 until, about 35 miles after the exit, you come to a fork on the road where you take the left side. This will take you along the side of the lake on a one-lane road. This is Sanford Riverwalk street in a residential neighborhood. Follow it until you reach a circle where you turn right. 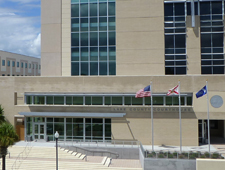 The Seminole county civil courthouse will be on your left. Where you see a sign that says 44 New Smyrna Beach, Deland Historic District, exit right. Stay on Exit 118 West to Deland Historic District. This will take you on the overpass of highway 44 over I-4. Exit on the sign that says 44 New Smyrna Beach, Deland Historic Dist. Stay to the right to get into Exit 118B. This will place you going west on highway 44. About one quarter mile after exiting I4 you will see a sign saying Deland 5. Once in Deland 44 will also be called New York Avenue. Turn right on Amelia Avenue and the entrance to the courthouse parking lot is to your left. Take highway 441 south to Leesburg and continue west on it until you reach Tavares. Exit 441 on highway 500A, also known as Lakeshore Blvd. Take: (a) highway 44 going south (or west) and make a right turn on highway, 441 or (b) if you are closer to 441 take it going north (or west), until you reach Tavares. Turn left on highway 19, also known as N. Duncan Dr. and left on Lakeshore Blvd. Take 33 or 27 going north (whichever is closer). Highway 33 turns into 19 after crossing highway 50. If you take 27, turn right on 19 until you reach Tavares. Turn left on highway 19, also known as N. Duncan Dr. and left on Lakeshore Blvd. Continuing From Lakeshore Blvd in Tavares. After a curve to the left, Lakeshore Blvd. becomes W. Alfred St. From there turn right on N. Sinclair Ave. and right on Main St. at the circle with the American flag. The Lake County courthouse will be on your right.